here's my card for this week's DTC. Shelly chose a super fun theme for us at the Digital Tuesday Challenge. When I saw this image from our sponsor "The little yellow company", I knew it was perfect for this challenge. Plus I love Elvis! I decided to make a CD cover. The image was colored with copics and cut out. I then mounted it to a star shape. Designer papers are from Stampin Up & DCWV and card stock is from Stampin Up. I sponged the white edges with turquise ink and did some sewing with my janome mini. 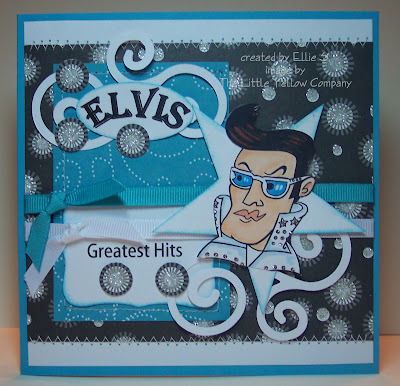 To finish this CD cover off, I added some grosgrain ribbon , sizzix flourishes and applied silver stickles to the image. The inside was inspired by a cover that Tina from Tina's Kreativeblog made. The words were computer generated. Thanks so much for visiting my blog today. The full recipe is below. Be sure to check out the digital tuesday challenge blog to see what the other designers created and maybe you can play along for a chance to win something from the little yellow company. All you have to do is make a card/project using a digistamp and something to do with music. Accessories & tools: grosgrain ribbon, stickles, nestabilities labels 8, large oval punch, sizzix flourish, big kick, half inch circle punch, janome mini. Elle what a way to honor elvis good job. HOW CUTE IS THAT!!!!! Wow Ellie I love this so creative and well done.